Over the years, Tecniq's Managing Director, Rob Falken has been honored to have his work featured in some of today’s most notable publications. Thanks for following along on the journey. "The new product is the brainchild of Vivobarefoot, which manufactures ultra-thin shoes, and Bloom, a company that uses algae to make ﬂexible foams. The algae-based foams are sturdy but light-weight, making them a 'naturally perfect material,' for performance footwear." 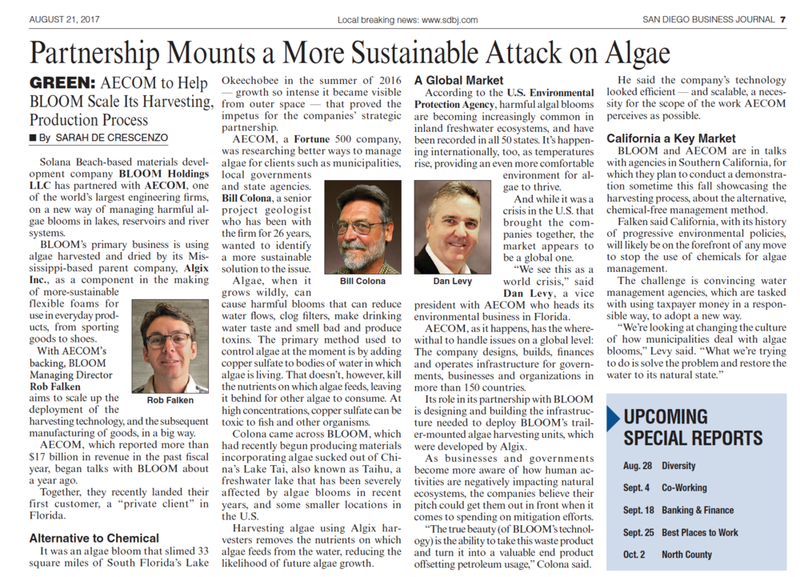 "Solana Beach-based materials development company BLOOM Holdings LLC has partnered with AECOM, one of the world's largest engineering firms, on a new way of managing harmful algae blooms in lakes, reservoirs and river systems." 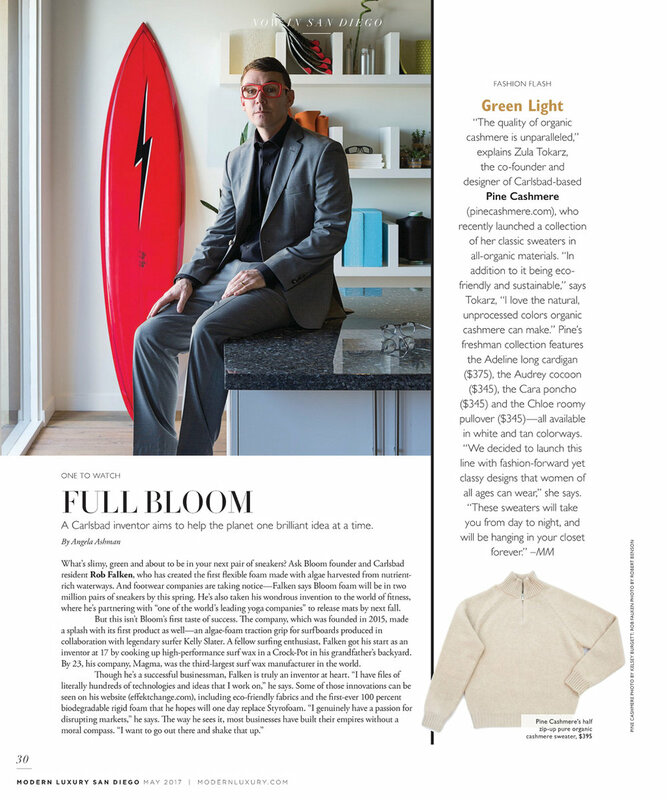 "One paddle board with BLOOM foam will return 176 gallons of clean, filtered water to the habitat from which the algae was harvested and keeps the equivalent of about 123 12-inch birthday balloons full of carbon dioxide from entering the atmosphere..."
"Back in 2015, we heard about how bioplastics firm Algix and clean tech company Effekt were collaborating to make eco-friendly foam based on algae instead of petroleum. The material is now being marketed as Bloom foam – by the newly-formed Bloom company – and you'll soon be able to buy shoes made out of the stuff." 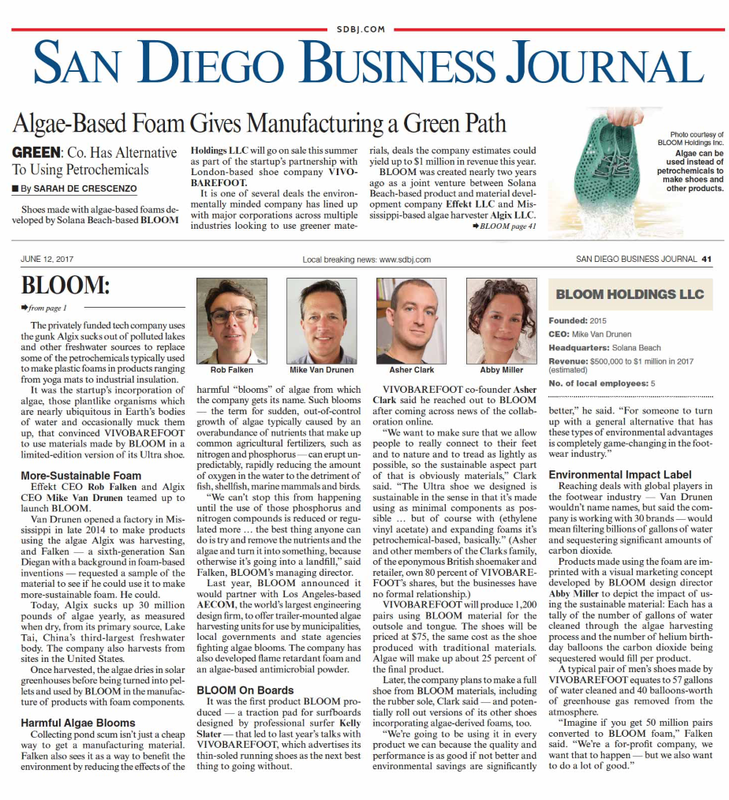 "Effekt CEO Rob Falken and Algix CEO Mike Van Drunen teamed up to launch BLOOM." Though he's a successful businessman, Falken is truly an inventor at heart. "I have literally hundreds of technologies and ideas that I work on," he says. BLOOM co-founder Rob Falken explained how the harvesting process works. "We work with any type of blue-green algae," he said. "Blue-green algae has polymeric properties, so we basically vacuum it off a lake and dry it using our continuous solar drying process." ”Slater Designs and Firewire Just Partnered with a Company that Makes Traction Pads Out of Algae"
"Rob Falken is the dude of all dudes. A passionate surfer with a dream to save the planet. Dude!.." "The joint venture’s aim is to help make sustainable products more easily accessible. It could be used to produce yoga mats, footwear, sporting goods (e.g. traction for surfboards) and toys, to name but a few. 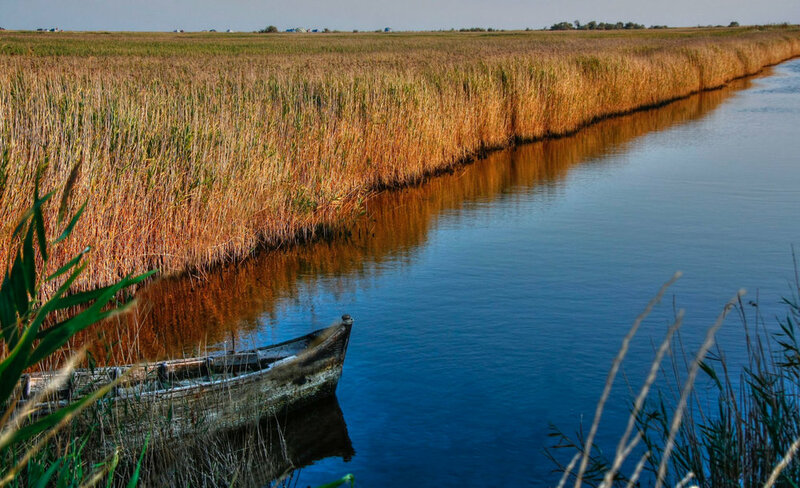 Rob Falken, Effekt’s and Bloom Holding’s Managing Director..."
"Instead of clogging waterways, algae is being made into safe, petroleum-free plastic. Inventor and Managing Director Rob Falken with Bloom explains how his company's plastic is reducing..."
"As big-wave surfing gets pushed further and further (and deeper and deeper), the risks athletes are taking get bigger and bigger..."
“Ian presented a real design challenge,” said Rob Falken, Managing Director at Tecniq. “He wanted his new custom life vest to incorporate an improved zippered entry and to have a reduction to the overall bulkiness, while maintaining or increasing the desired buoyancy..."